If you're a coffee lover and it's time for dessert try my Caramel Macchiato Bread Pudding! 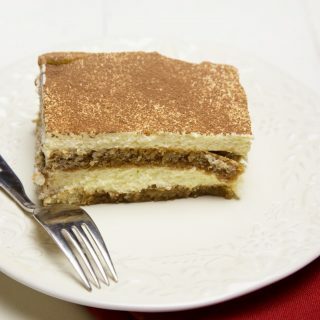 The Kahlua creme Anglaise is the perfect compliment to this coffee lovers dream dessert! 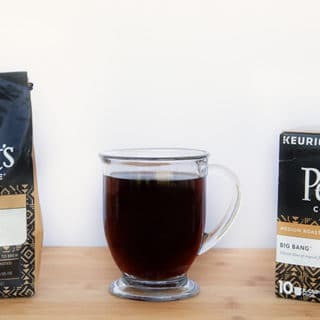 Do you cook with coffee? What would this world be like without coffee? That’s something I hope we never have to find out! Not only is coffee my favorite Good Morning beverage, it’s also an excellent ingredient for everything from barbecue to desserts. 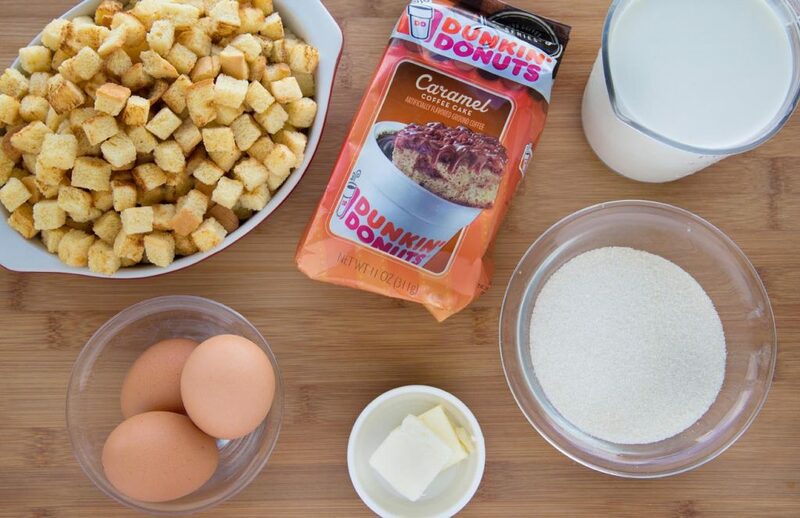 Although I don’t usually buy flavored coffees I thought that the Dunkin’ Donuts Caramel Coffee Cake Coffee would add just the flavors I was looking for for my bread pudding. 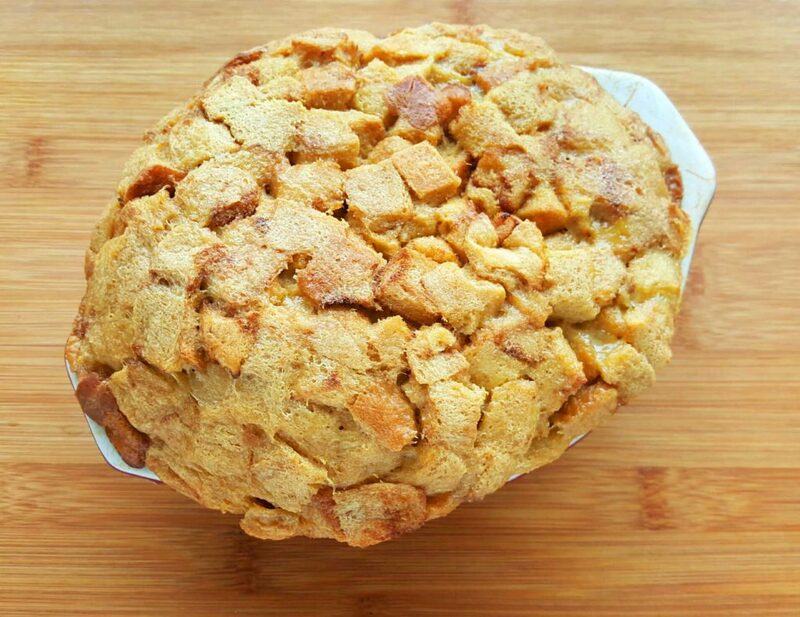 What Ingredients to I need to make Caramel Macchiato Bread Pudding? 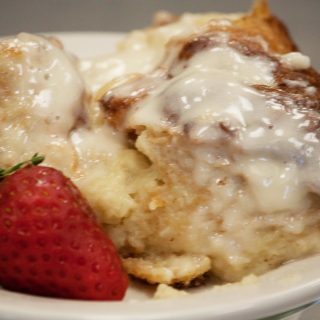 Let’s get started with our bread pudding recipe by gathering our ingredients. In chef speak this is called the mise en place. 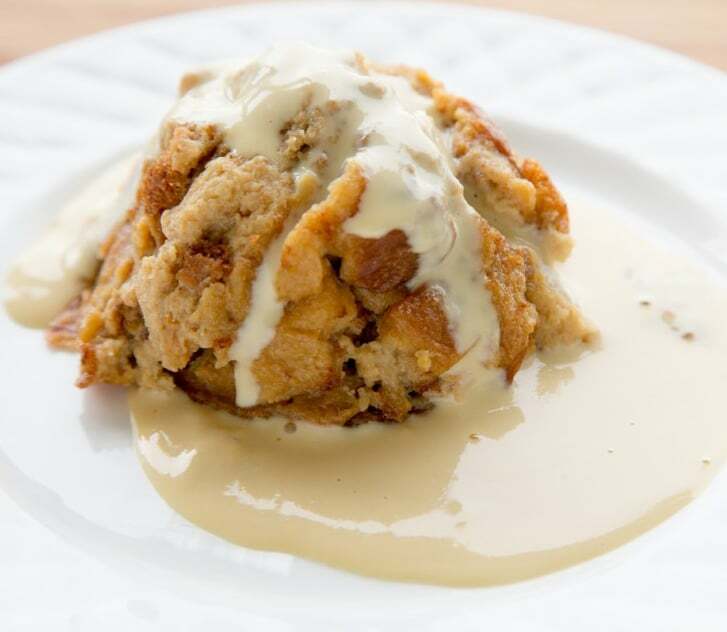 Do you know the secret to making Bread Pudding? The trick to making good bread pudding is using enough eggs and using enough milk (or in this case half and half). I normally use milk when making my bread pudding but because I was adding in additional liquid (coffee), I thought the half and half would help keep the pudding rich and creamy. The biggest issue with most bread puddings is there too heavy and can be used as door stops. This won’t be the case with my recipe because it calls for enough liquid to completely cover the bread. 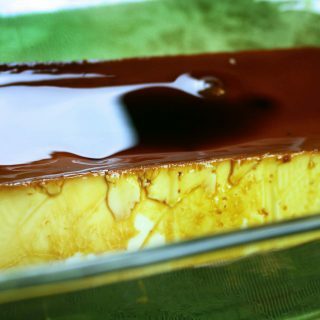 The other key to success is allowing the pudding to sit at least 15 minutes before baking (overnight is good too). This allows the bread to completely soak up the liquid before baking. Although the added butter (drizzled over the top) isn’t essential, at this point I figure what the heck and might as well make it memorable! Don’t get too excited when you take the bread pudding out of the oven. It will be OMG high and beautiful……sigh…..but then it falls. That’s just the way it is, nothing you did or can do to change it. If you love bread pudding my Cranberry Egg Nog bread pudding would be a hit in the fall and holiday season and of course my Classic Bread Pudding. 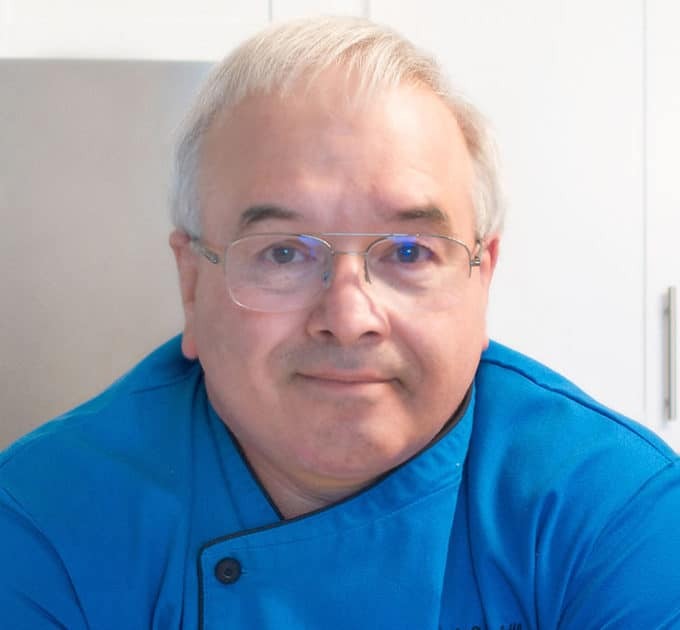 If you’ve tried my Caramel Macchiato Bread Pudding recipe or any other recipe on askchefdennis.com please don’t forget to rate the recipe and let me know where you found it in the comments below, I love hearing from you! Add Sugar to coffee in a small saucepan and bring to boil reducing the coffee to 1 cup. Once reduced allow coffee syrup to cool. Gently beat the eggs, then add the milk, vanilla and coffee syrup. Whip until well blended. Pour the mixture over the cut bread, mixing it well so that all of the bread has absorbed some of the milk. Let it sit for at least 15 minutes. Drizzle the melted butter over the entire pan letting some of the butters richness touch as much of the top of the mixture that it can. Cover the pudding with cling wrap (restaurant habits die hard), then cover it with foil. Bring 4 eggs to room temperature, and separate using only the yolks. In a small pot heat half and half until it is simmering, remove from the heat. Slowly mix half of milk into the egg mixture, stirring the eggs as you pour the hot milk into them. Add the egg mixture back into the remaining milk along with the vanilla and continue to simmer for about 5-7 minutes until the mixture has slightly thickened, use a rubber spatula to stir the mixture constantly, getting into all the corners. Place the pot with the finished sauce in a bowl of ice water to cool it down quickly, stirring as it cools. 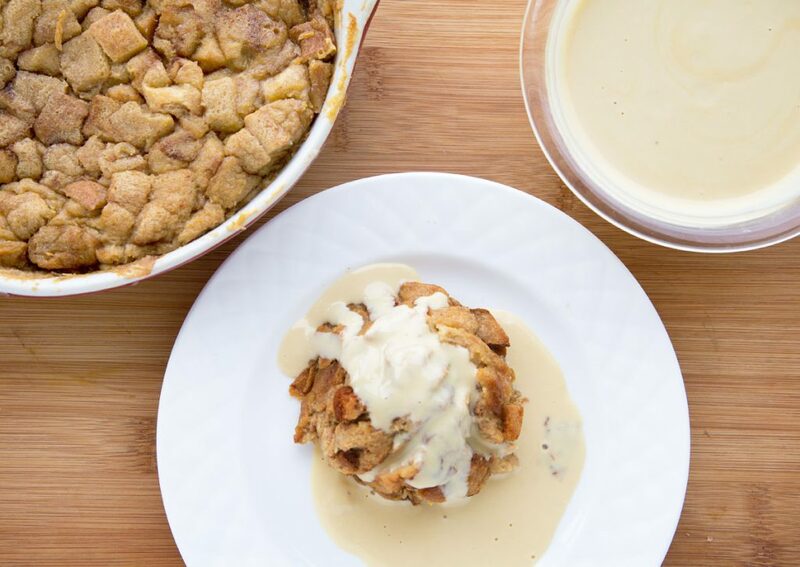 Place the Creme Anglaise in the refrigerator to get completely chilled and serve with the warm bread pudding. **do not get the creme anglaise too hot and don't be tempted to leave it on too long to try and continue to thicken. It will break and be unusable if it heats too long. Previous Post: « Homemade Pizza is easier to make than you think!